The Foreign Service Journal covers foreign affairs from an insider's perspective, providing thought-provoking articles on international issues, the practice of diplomacy and the U.S. Foreign Service. Including the AFSA News section, The Journal is published monthly (January-February and July-August issues combined) by the American Foreign Service Association. 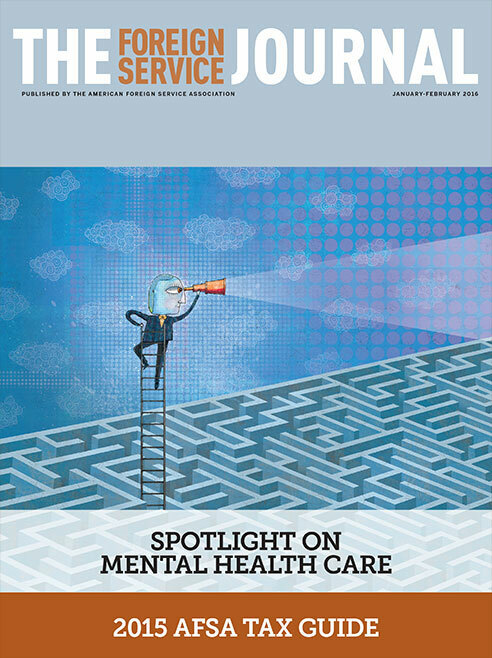 The January-February issue focuses on mental health care for the Foreign Service. We always welcome short, focused letters about FSJ content; please send them to journal@afsa.org. MED’s mental health program has grown and evolved over the years to address the unusual needs of FS employees and their families serving overseas. The State Department’s Employee Consultation Services can help members of the foreign affairs community resolve workplace and interpersonal concerns. State’s 22 regional medical officer/psychiatrists are the backbone of mental health support for the Foreign Service community overseas. One DS special agent offers his own case as a model for successful rehabilitation from mental illness. As part of our look into mental health services for the Foreign Service, we asked members in the field for their thoughts. Here is a compilation of candid views. Foreign Service children are just as at risk of mental health problems as the average American child, if not more so. This is the heartbreaking story, told by a devoted spouse, of a vibrant and trailblazing FSO’s descent into the most insidious form of dementia. Samuel Lewis’ ambassadorship in Israel demonstrates how a professional diplomat can have an important influence on the shaping of foreign policy. Setting out your end-of-life instructions, including provisions for medical care and the distribution of assets to the next generation, is an essential task. This will help you get started.